The Gizis Exclusive has a swimming pool with views of the Caldera and enjoys a privileged location on the cliff of Imerovigli. The property provides free public Wi-Fi and parking. Please inform Gizis Exclusive in advance of your expected arrival time. For this, you can use the special requests section when making the reservation or contact the accommodation directly. The contact details appear on the booking confirmation. This open-plan suite is traditional in style and features an outdoor hot tub with views of the Caldera. This family room has air conditioning, 2 bedrooms, 2 bathrooms and a balcony with views of the Caldera. 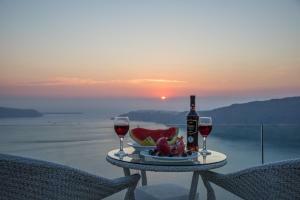 This room has a balcony with views of the Caldera, air conditioning and a flat-screen TV. This family room is located at pool level and has 2 bathrooms and terrace overlooking the Caldera.